And now things get freaky. The “What's that? !” from the previous issue turns out to be Cudley, the “transdimensional cowlick”. Cudley’s a flying cow’s head that travels through dimensions, carrying passengers in his mouth. He takes the Turtles to the Stump Asteroid, where they meet Stump and his financial partner, Sling. 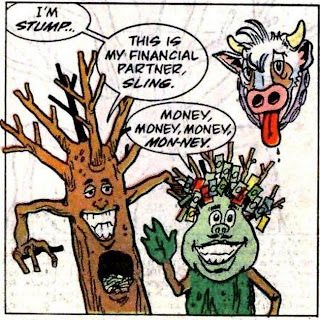 Stump’s a talking oak tree, of course (and probably a Donald Trump parody), and Sling is some type of humanoid money tree. 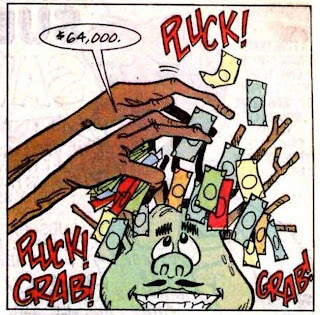 He grows money as hair/leaves, and the dollar amount apparently depends on his level of excitement. 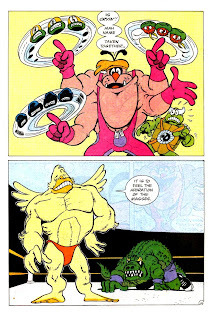 An intergalactic wrestling tournament is filmed on the asteroid, and Stump wants the Turtles to participate. With no real options, they go along. They’re pitted against Cryin’ Houn’, a four-armed dog-man who can apparently only speak his own name (I get that his name is an Elvis reference, but I don’t know if there’s another joke I’m missing). They also learn that Leatherhead is there, after Cudley saved him from his fall in the previous issue. He’s wrestling Ace Duck, a burly, self-absorbed duck in a speedo (and one of the early action figures). Each fight is given half of the page to play out, with the Turtles’ battle at the bottom of the page and the Leatherhead fight on top. It’s a fun gimmick that allows kids to read the story in different ways, until the two plot threads merge. Cudley suddenly develops indigestion and spits up the Turtles’ ninja weapons. The Turtles threaten Stump and Sling, who agree to order Cudley to take them back home. Leatherhead enjoys the adulation of intergalactic wrestling and opts to stay behind. Cudley takes the Turtles to Earth, but accidentally arrives one hundred years in the future, where the polar icecaps have melted and flooded New York City. (Remember, kids: Reduce, Reuse, Recycle, or else the Earth is going to die.) He realizes his mistake and soon takes the Turtles back home, leaving them in the middle of a thunderstorm. Review in a Half-Shell: It’s a variation on the genre classic of “heroes forced to fight in gladiator games,” which is livened up by the sheer insanity of the new characters. It’s certainly entertaining, but Jim Lawson’s art is quite a step down from Ken Mitchroney’s. As a kid, I hated his sparse, simplified style. I can appreciate it more today, and recognize that he does a good job on the wrestling scenes, but some of the art almost looks amateurish. What the Shell? Uh, see everything above. This book has suddenly turned into an LSD trip in-between issues. 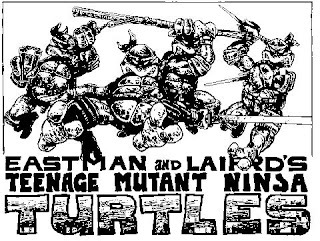 I Was Not Aware of That: The wrestling outfits the Turtles wear are the original outfits designed for the characters by Eastman/Laird. The creators of the Archie series thought that the designs were a part of Turtle history and shouldn’t stay hidden in a drawer. (You can read more at Steve Lavigne and Ryan Brown's blog). 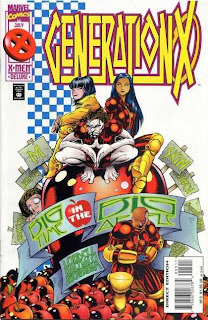 Also, the indicia reveals that the writers and artists of this series own the rights to characters like Cryin’ Houn’ and Cudley (Stephen Murphy is credited with his pseudonym “Dean Clarrain” but the copyright notice is in his real name), while Mirage Studios owns the preexisting characters. Turtlemania: There’s an ad for TMNT t-shirts, featuring art that looks like it’s from the original series. An American Entertainment ad also lists Turtle calendars, videos, watches, lunch boxes, and buttons for sale (one VHS with two episodes of the cartoon costs $18.95!). I Love the (Late) ‘80s: There’s an advertisement for the Nintendo Power Glove on the inside back cover. Boy, that’s a limp cover. The interior art is thankfully a lot more exciting. Another issue, another new character for the Archie continuity. This issue introduces Jess Harley, a poor Bayou man who steals a gem from a swamp witch named Mary Bones. He travels all the way to New York to sell it, only to drop it in the sewer after a pack of pizza-obsessed teenagers accidentally bump into him. 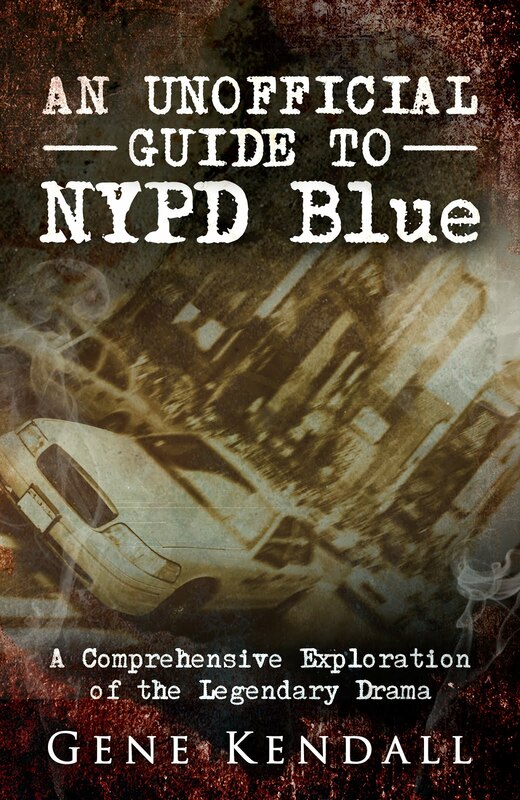 He soon recovers the gem, but is shocked to discover Mary Bones has followed him to New York. She explains that the gem is actually a “turnstone,” and she uses it to transform Jess into the human alligator, Leatherhead. Leatherhead tries to tackle her, but only crashes deeper into the underground. He lands in Shredder’s lair, where Shredder quickly takes advantage of Leatherhead’s new condition. Shredder explains that the Turtles are servants of Mary Bones who actually volunteered to be turned into animals. (Just in case any of the slow kids were confused, Shredder has a helpful thought balloon a few pages later that reads “Ha! Ha! Ha! I am SUCH a good liar!”) Leatherhead joins Bebop and Rocksteady on their latest mission to destroy the Turtles. Meanwhile, Shredder reveals his plan to Krang, who is still in Dimension X. Krang tells Shredder that Mary Bones’ device is actually a “Transanimator” and that she must be another exiled warlord from Dimension X. Review in a Half-Shell: The basic plot is rather familiar, only now the new mutant briefly fights against the Turtles instead of automatically teaming up with them. The book is still finding its way, but there is a little foreshadowing for upcoming issues, so the narrative is already getting a little more complex. I Was Not Aware of That: Krang wants Mary Bones’ Transanimator so that he can regain his original body. I thought he really was a giant brain (he’s based on a race of aliens from the original comics). I didn’t know he was ever supposed to be something else. Pizza References: One and a half. The Turtles are on their way to a pizzeria when they bump into Jess, and a few pages later we see them inside the restaurant. 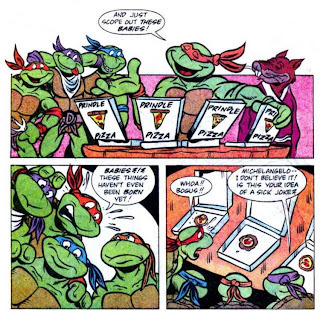 One of the early running jokes of the series had the Turtles putting bizarre toppings on their pizza. In this issue, it’s rhubarb, kiwi fruit, fried clams, and peanut butter cups. It doesn’t seem like much of a joke to me today, but I guess kids love gross-out humor. Absolutely Approved By The Comics Code Authority: Leonardo saves Rocksteady when he accidentally knocks him off of the bridge, instead of letting him fall to his death. Turtlemania: The Turtles ride their “Cheapskate” skateboards in this issue. I had that toy as a kid and seem to recall that fan on the back constantly breaking off. 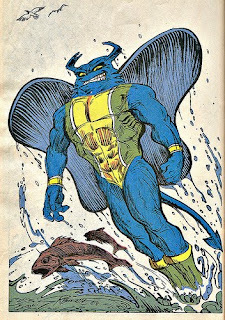 Issue #5 marks the first original story for the Adventures series, introducing Man Ray, an anthropomorphic manta ray who will eventually receive his own action figure and appear in the cartoon. For years, I assumed this title was put together by Archie staffers, but only recently did I learn that Mirage assembled the creative teams and owns the rights to all of the characters. It was a great thrill to me as a kid to see characters that I followed for years in the Archie series show up in more “official” Ninja Turtles material. Other fans, however, were annoyed by the liberties taken to the characters (Man Ray was apparently renamed…ugh…“Ray Fillet”). In the Archie Comics canon, Man Ray is an aquarium employee (with no name, as far as I can tell) who is concerned about pollution at the local beach. 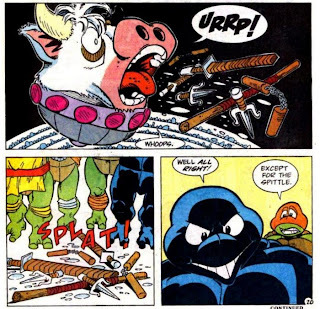 When he investigates a sewer pipe, he’s exposed to mutagen ooze that Bebop and Rocksteady accidentally spilled earlier. He drifts into the ocean, where he mutates into the animal closest to him, a manta ray. Meanwhile, the Turtles enjoy a night at the beach. 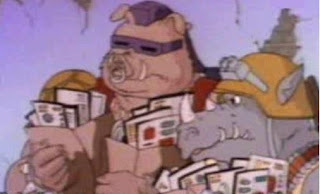 They’re spotted by Bebop and Rocksteady, who are hiding out with Shredder in a nearby submarine. Shredder launches a torpedo, but Man Ray grabs the missile and sends it back to Shredder. Soon, the Turtles invade the submarine and face Bebop and Rocksteady. Shredder escapes, but is tracked down by Man Ray. After Man Ray physically dominates Shredder in the water, he drags him to shore. Shredder kicks sand in Man Ray’s face, which is apparently devastating for manta rays, and escapes again. Man Ray explains to the Turtles that he can’t stay outside of the water for long and jumps back into the ocean. The Turtles say goodbye and enjoy the 4th of July fireworks. Review in a Half-Shell: This isn’t a cartoon adaptation, but the story could’ve just as easily been an episode of the animated series. The plot’s very simple, the villains aren’t much of a threat, and the Turtles make a new friend at the end. 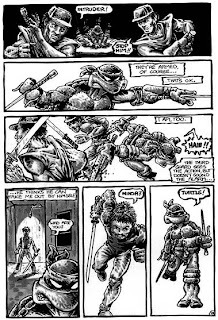 Mitchroney’s expressive art livens up the predictable story, and the Turtles’ brotherly interactions are handled well. What the Shell? : No one recognizes the Turtles at the aquarium, even though they’re only disguised with hats and street clothes (normally, they’re hidden in trenchcoats, which isn’t a great disguise either, but doesn’t stretch disbelief quite so far). Bebop and Rocksteady are back on Earth with Shredder without explanation. Shredder wants to destroy the Statue of Liberty on the 4th of July, apparently just because he’s evil. Pizza References: Two. 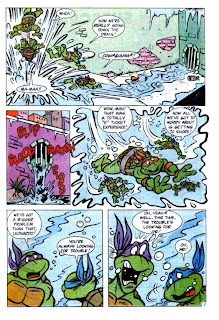 The Turtles head for a pizzeria after leaving the aquarium, and Michelangelo later declares that he wants a pizza “like now!” while watching the fireworks display. Absolutely Approved By The Comics Code Authority: Man Ray saves Shredder’s life after he destroys his oxygen tank underwater. Turtlemania: There are ads for TMNT cereal (basically Chex with marshmallows, and remarkably similar to the ‘90s Spider-Man cereal that had “webs” instead of “ninja nets”), the upcoming 1990 movie, and the first NES Turtles game. Meanwhile in Riverdale…: A PSA shows Archie and the gang studying Algebra, partying, and winning a track meet, all without the help of drugs. We’re also invited to “order tons” of a 1990 Archie calendar. Credits: (Issues #1-#2) Dave Garcia (writer/artist). Adapted from a script by David Wise and Christy Marx. Archie’s monthly TMNT series begins, unfortunately, with more adaptations of the cartoon. The first two issues adapt “Return of the Shredder,” which has Krang sending Shredder back to Earth in order to prove himself. Out of spite, Krang sends Shredder alone, without Bebop, Rocksteady, or any Foot Soldiers for support. Shredder decides the most efficient way to lure the Turtles out of hiding is to overtake the thugs at the “Slash 4 Cash Gym” and have them commit robberies in ninja turtle disguises (although Shredder kidnapped Splinter in the initial storyline, so it seems like he should already know where the Turtles live). 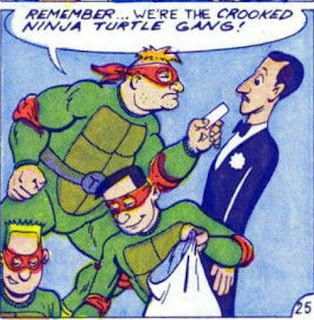 The fake Turtles go on a crime spree, which reaffirms April O’Neil’s boss’ suspicions about the Ninja Turtles. While Spider-Man’s mortal nemesis J. Jonah Jameson is motivated by his distrust of people who hide behind masks, or his own insecurities and jealousy (depending on which story you read), Burns Thompson’s hatred of the Turtles is driven by a more basic desire. When Krang receives word of Shredder’s master plan, he chides him for wasting time on a plan that could take forever. Shredder, eager to please Krang for reasons that aren’t particularly clear, heads to the “Sunnydale Home for the Extremely Overwrought” to recruit Dr. Baxter Stockman. After Shredder frees him, Stockman creates another rat-catching machine and once again kidnaps Splinter in the sewers. The Turtles track Stockman to Shredder’s hideout, where they easily defeat their imposters and soon confront Shredder. Shredder is preparing to kill a captive Splinter with a massive battering ram, but Baxter Stockman suddenly breaks through the walls in his ratcatcher machine. The device soon goes out of control, enabling the Turtles to rescue Splinter and escape. With Splinter saved and the imposters exposed, it’s a happy ending all around…except for Burns Thompson, who must pay the price for journalistic integrity. Credits: (Issues #3-#4) Beth & Ken Mitchroney (writers), Ken Mitchroney (penciler), Dave Garcia (inker). Adapted from a script by Larry Parr. Issues three and four adapt the “Incredible Shrinking Turtles” episode. Since every ‘80s cartoon character had to shrink down to either toy or insect size at one point or another, I guess the producers decided to get this story over with early. This is the debut of Ken Mitchroney, whose art I fondly remember throughout the run of the series. He’s a very expressive cartoonist who can also do action quite well, making him a perfect fit for the book. The story has the Turtles discovering an alien who’s crash-landed on Earth. The dying alien tells the Turtles that they must recover the three pieces of the Eye of Sarnath, which will grant “power undreamed” to whoever possesses it. Shredder secretly follows the Turtles on their quest, and steals the first fragment they discover. The jewel’s power shrinks the Turtles to just a few inches high, and they’re quickly washed into the sewer. Shredder contacts Krang, hoping that he’ll send his Foot Soldiers back to Earth (I guess that’s why Shredder is so eager to please him, but it still seems like an odd inversion of their original relationship). Krang doesn’t believe that Shredder has eliminated the Turtles, and demands proof of the crystal’s power. 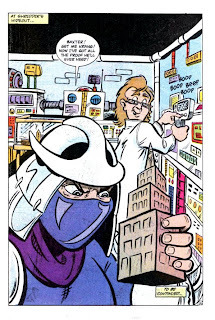 Shredder’s response, of course, is to shrink the Empire State Building. Krang isn’t impressed by the “toy building,” he just wants those Turtles dead. (I don’t quite understand why Krang hates the Turtles so much. Originally, he just wanted Shredder to give him a robot body, which he did. Krang really doesn’t have much to do with the Turtles, but he sure does hate them. I guess his motivation is just anger over the fact that they defeated him in the initial miniseries.) Meanwhile, the tiny Turtles are floating through the New York sewer system. The shrunken heroes gimmick is used pretty well, as the Turtles are forced to sail on a bar of soap. When they’re attacked by a snake, Leonardo has to feed the snake larger and larger chunks of the soap before it gets sick and retreats. The Turtles are left with a tiny piece of soap to sail on, which is shrinking by the second. Soon, they're swallowed by a storm drain, where we discover their uncanny ability to speak underwater. They’re rescued by Baxter Stockman, who brings the Turtles to Shredder. Shredder shows off the shrunken Turtles to Krang, then prepares to kill them with a crowbar. Luckily, Splinter and April O’Neil arrive to save the day. Splinter and Shredder have a martial arts fight for a few pages, while April retrieves the shard of the Eye of Sarnath. The Turtles somehow reason that it couldn’t possibly make them smaller (I guess they've never heard of the Atom), so April uses it to restore them to their natural height. Soon, the Turtles rescue Splinter from Shredder (whose hideout is apparently an abandoned cheese factory, because he’s trying to kill Splinter with a “cheese-wrapping machine”). However, they lose the shard after Splinter accidentally knocks Shredder into April. 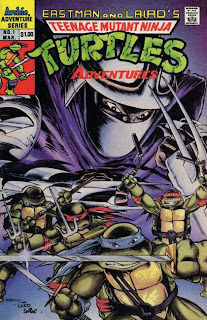 Shredder escapes, which leaves the Turtles without any of the three shards of the Eye of Sarnath (according to Wiki, the Archie series continues this subplot, and resolves it differently than the cartoon). As for the Empire State Building, April later reports that the “shrinking business” has stopped, so I guess the jewel’s power was never permanent in the first place. Splinter tells the Turtles that there’s much to learn from failure, which I’m sure was supposed to be the pro-social message of the episode. They return home, where we uncover the Turtles’ intense loathing of Pizza Hut personal pan pizzas. Since the book is still adapting cartoon episodes, there’s really not a lot going on. Issues three and four aren’t bad, but that’s largely due to Ken Mitchroney’s charming artwork. The book is now taking two issues to adapt one episode, which does at least alleviate the claustrophobic feel of the earlier issues. With more room to tell the story, it feels like more of a legitimate comic book. However, the stories that are being adapted, with the exception of a few jokes, are pretty bland. At least the original material begins next issue. "Before I leave, I want to mention a new comic due out soon [as far as I know, it's no joke, either] that combines all the latest comics fads into one book: teenagers, mutants, ninjas, and (serious) funny animals. It's... TEENAGE MUTANT NINJA TURTLES". 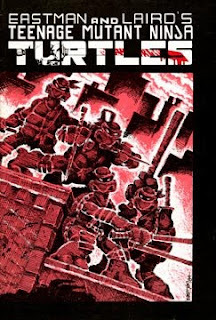 According to legend (one debunked by Peter Laird himself), the original inspiration for the Teenage Mutant Ninja Turtles was a comment made by Frank Miller in an interview that “all Marvel publishes these days are teenage mutant ninja comics” (paraphrasing). 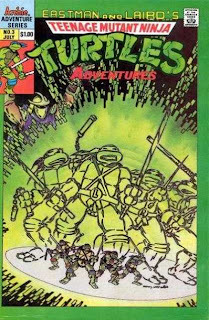 The first issue of the original series by Kevin Eastman and Peter Laird was dedicated to Frank Miller (and Jack Kirby), and the ‘80s Miller influence is all over the comic (the logo is even a riff on Ronin’s logo). 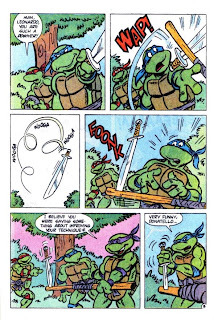 The entire comic can be read at the Turtles’ official website. Both Yoshi and another clan member, Oroku Nagi, were in love with a woman named Tang Shen. Shen rejected Nagi, and he responded with violence. Yoshi walked in on the incident and killed Nagi “in a red haze.” Shamed, Yoshi and Shen fled to America. Nagi’s younger brother, Oroku Saki, grew to adulthood hating Yoshi. At age eighteen, he was sent by the Foot to lead their New York branch. Saki renamed himself “the Shredder” and promptly murdered both Yoshi and Shen. Without an owner, Splinter roamed the streets of New York, searching for food. One day, he witnessed a strange container fly out of the back of a truck. (It swerved to avoid an elderly blind man. The teenage boy who pushed him out of the way is another Miller homage.) The canister struck a boy’s bowl of pet turtles near an open manhole. Splinter soon found the turtles and the canister in the sewers. Within a few days, the ooze that escaped from the canister had transformed them into humanoid animals. He began teaching the Turtles the martial arts he learned from studying Hamato Yoshi, preparing them to one day confront the Shredder. 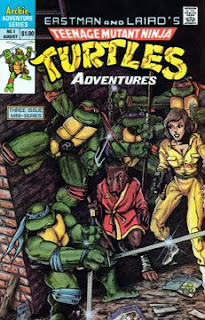 Splinter, claiming he’s at the end of his life, asks the Turtles to finally avenge the murders of Hamato Yoshi and Tang Shen. Raphael sends a message to the Foot Clan, demanding Shredder agree to a duel. 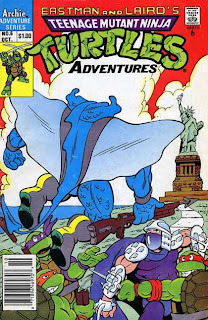 The Turtles soon face Shredder and an army of Foot ninjas on the rooftops of New York. Shredder is defeated (after Leonardo runs him through with his katana blade), but he refuses to die with honor. 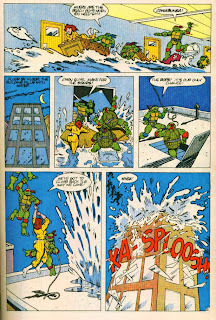 He brandishes a thermite grenade, forcing Donatello to push him off the building. Shredder apparently dies when the grenade goes off. Their mission accomplished, the Turtles fade into the night. 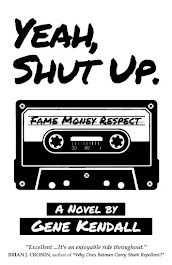 Looking back, it’s hard to distinguish how much of this is supposed to be homage and how much is parody. The idea is played straight, without any emphasis on the inherent silliness of the concept. I guess, like any superhero comic, the absurdity is just a part of the appeal. Yes, a story about ninja turtles is a dumb idea, but that doesn’t mean it can’t be entertaining. The title was originally supposed to be a one-shot, but it was such an unexpected hit, Eastman and Laird’s Mirage Studios quickly began a regular series. TMNT seemed to hit the market at the right time, riffing on Marvel’s mutant craze, the burgeoning ninja fad, and the increasing number of post-Cerebus talking animal indie comics. 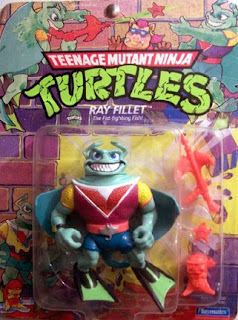 Within a few years of its release, the Turtles were already being merchandised as a new action figure line and syndicated cartoon. 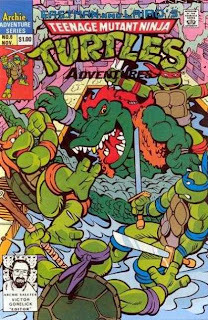 Archie Comics picked up the license to adapt the early episodes of the cartoon into a comic, Teenage Mutant Ninja Turtles Adventures, and eventually began publishing new stories with the characters. This was a smart move on Eastman/Laird’s part, as it exposed the characters to a market that would’ve never seen an independent Mirage Studios comic at the local grocery store. I have a reprint of the original three-issue Archie miniseries, released with a cassette tape acting out the story, published by Random House. The indicia indicates it’s the seventh printing, making me wonder just how many copies ended up in circulation. 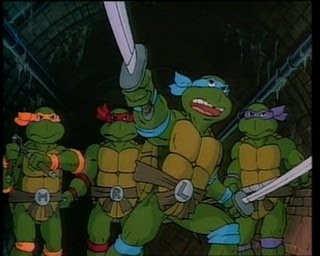 The three issues adapt the first five episodes of the cartoon series, introducing the Ninja Turtles to a kid-friendly audience. 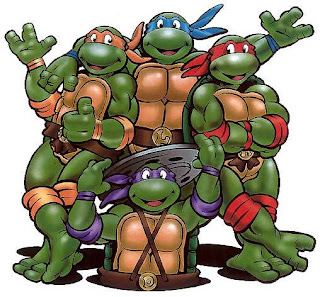 The designs of the characters are the most noticeable change, as the Turtles become rounder and cuter. Their masks now have distinctive colors, and their belts helpfully identify the letter their name starts with. 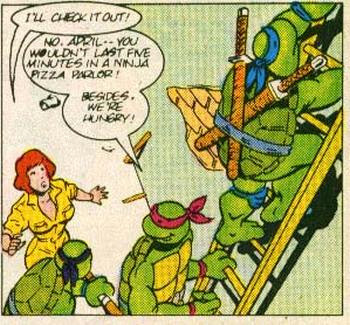 The Turtles’ attitudes have also shifted, going from grim warriors to catchphrase-spewing teens who just love pizza. These guys eviscerate coke dealers. These guys want to be your best friend and buy you birthday presents. 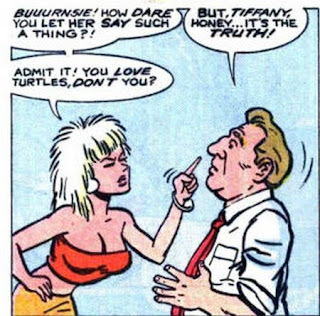 In fairness, most of the Turtles do maintain personality traits that were established in the early issues of the original series. Leonardo is the stoic leader, Donatello is a technical genius, and Michelangelo is somewhat immature and childlike. Raphael was originally the rebellious loner, but that personality seems to have been altered to make him the clever, sarcastic member. Only now do I realize that many of these personalities seem to mirror the X-Men, with Leonardo acting as Cyclops, Raphael as Wolverine, and Donatello as Beast. Michelangelo is the only one without an obvious counterpart. The new origin has elements of the original comics, but obviously a lot of the material is toned down and sanitized. 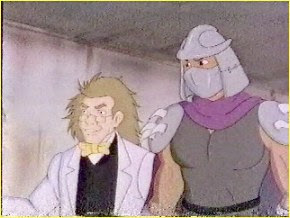 Hamato Yoshi is now a teacher in the Foot Clan, who is targeted by a jealous student named Oroku Saki. Saki pins Yoshi’s robe to the wall, preventing him from bowing before the Foot’s master teacher. Yoshi is kicked out of the clan for disrespecting the elder, while Saki goes on to lead the Foot into crime. Yoshi moves to America, where he’s forced to live in the sewers. One day, he discovers four pet turtles after they’re accidentally dropped in the sewers. A mysterious liquid soon enters the sewers, transforming whoever touches it into the animal they’ve most recently had contact. 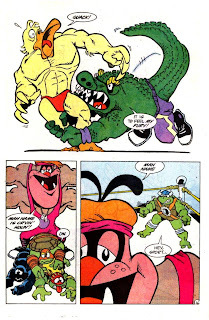 The turtles mutate into humanoids because they last had contact with Yoshi, and Yoshi transforms into a giant rat because he was closest to the rats. Later on, we learn that Oroku Saki, now the Shredder, sent the ooze into the sewers, hoping to kill Yoshi. The new continuity eliminates Oroku Nagi and Tang Shen, but I wouldn’t necessarily say it’s been streamlined. 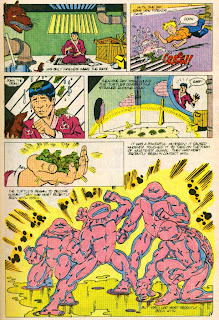 (The portrayal of the ooze is simpler in the original continuity, which is probably one of the reasons why the movie continuity sticks closer to the original comics. The Daredevil homage is also eliminated in this version, although for years I thought it was included in the origin recap on the back of the action figures.) The Foot Clan also undergoes a makeover, as Shredder’s soldiers are now robots. Now, the Turtles can slice and dice their opponents without offending network censors. The early storyline of the cartoon/Archie series has TV reporter April O’Neil (a lab assistant to the deranged Dr. Baxter Stockman in the original comics) targeted by Shredder because of her investigation into the city’s crime spree. While running from Shredder’s goons, she’s rescued by the Turtles. They quickly become friends, setting April up as the Turtles’ connection to the human world, and as the perpetual damsel in distress, of course. April may be the reporter, but it’s the Turtles who discover a matchbook with a major clue. 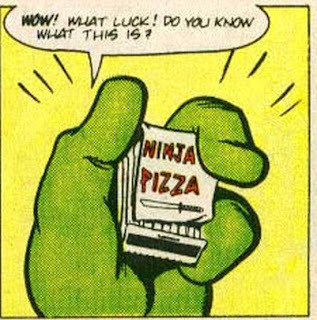 The Turtles visit Ninja Pizza, which just happens to be a part of a ninja strip mall. The stores are a front for Shredder, which April discovers while snooping around a nearby security firm. She’s quickly kidnapped, and used to lure the Turtles into a trap. After the Turtles defeat a few Foot Soldiers, they’re trapped inside a flooded building. The comic really doesn’t do this scene justice, because I can assure you I found this sequence in the cartoon thrilling as a kid. In the comic, it just sits there. The first five episodes of the cartoon were designed to showcase the action figure line, so new characters are thrown at the audience at a staggering rate. Since Archie is trying to fit this into three issues of a comic, that means new characters show up on what seems like every other page. 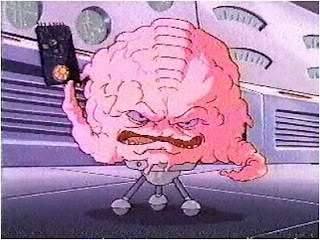 Krang is an alien brain from Dimension X, exiled to this world as punishment. He’s teamed up with Shredder in the hopes that Shredder can provide him with a body. Bebop and Rocksteady are two thugs mutated into a human boar hog and rhino by Shredder. When Shredder decides to open a portal to Dimension X and find new weapons, the Neutrinos escape. 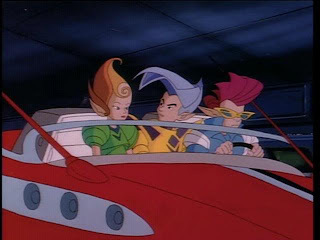 The Neutrinos are peace-loving teens in flying cars that briefly cause the Turtles trouble before they realize they’re on the same side. (Looking online, it seems that there weren't any Neutrino toys until 1991.) Dimension X also brings us the Stone Warriors, Krang’s loyal soldiers who predictably can’t handle the Turtles, either. 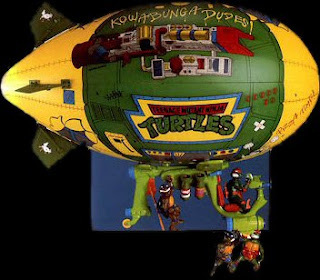 Before the story’s over, we’re also introduced to some vehicles and playsets, such as the Turtle Van, Shredder’s Terrordrome, Kang’s giant robot body, Foot Clan ATVs, and the Turtle Blimp (which really was an awesome toy). Since Splinter actually is Hamato Yoshi in the new continuity, the character is given a new motivation to explore. He wants to become human again, unlike the Turtles who enjoy their mutation. This idea does have potential, but it’s dismissed in the final chapter when Splinter destroys Shredder’s retro-mutagen gun, the only device that can restore his humanity. Splinter declares that it’s his karma to live life as a rat (which makes him oddly happy), before leading the Turtles in a battle that sends Shredder and Krang to Dimension X. The comic adaptation is written and penciled by Michael Dooney, and adapted from scripts by TV writers David Wise (incorrectly credited as "David Weiss") and Patti Howeth. The three issues of the comic have to adapt around 100 minutes of TV action, which results in a rushed, cramped comic that often has between six and nine panels per page (just think of any Marvel or DC movie adaptation comic). Some of the humor manages to translate, but a lot of the jokes are just flat. And teeny tiny panels rarely do justice to action scenes. Archie still has a few more TV adaptations to go, and then the Adventures series really takes off. I was initially reluctant to give in to the Teenage Mutant Ninja Turtles craze of the late ‘80s. I was already getting into Marvel superheroes, and dismissed the Ninja Turtles as some sort of kiddie, talking animal fad. A younger friend of mine converted to Turtlemania early on, and loved to show off his action figures to me. 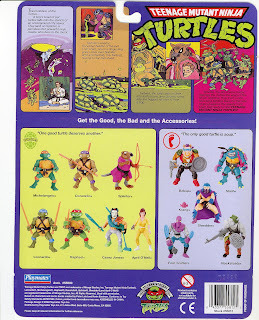 When I read the origin story of the characters printed on the back of the toy package, I realized that the Turtles actually had a comic book-style origin (later on I would realize their origin is partially a parody of Daredevil’s). 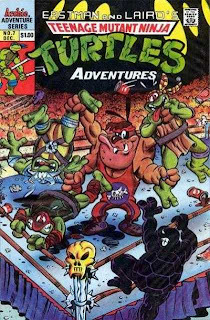 Knowing that there was actually a reason why these turtles could think, talk, and practice martial arts raised my opinion of the franchise. I rented the VHS repackaging of the cartoon’s first five episodes and was hooked. No more Transformers or G. I. Joes for Christmas (those figures were starting to look lame anyway), I wanted Turtles. And I certainly wasn’t alone, as the franchise dominated kid’s pop culture throughout the late ‘80s and early ‘90s. Since I was already into comics, it wasn’t a stretch for me to pick up Archie’s Teenage Mutant Ninja Turtles Adventures. That series will be the focus of this blog for the foreseeable future. I haven’t read these comics, or watched the cartoons, since they were originally released. I don’t pretend to know anything about Turtles mythology, or what kind of fandom exists online. 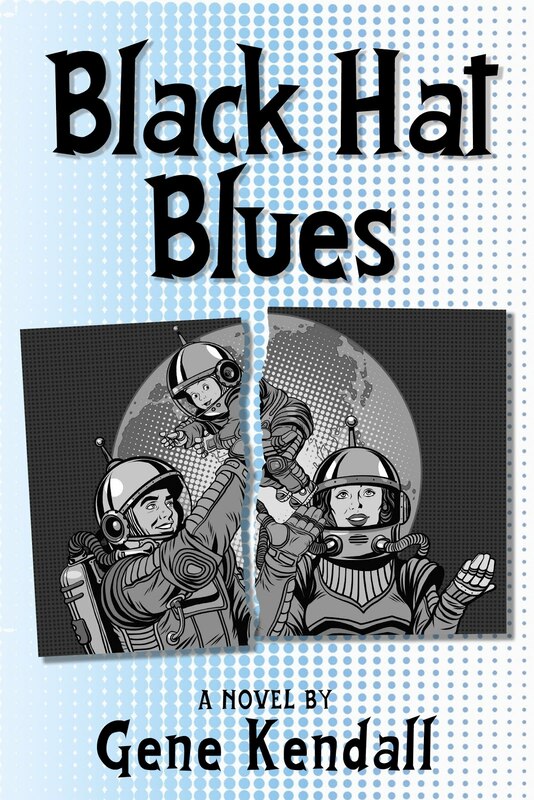 I do have a reprint of the first few issues of the original B&W series, and I’ll be rereading that to see how the origins of the kid-friendly version differ from the original comics. I have no idea what I’ll find in these comics, and I don’t know if they’ll spark any type of an interesting analysis. Basically, I don’t know how long I’ll keep this theme up, but it should be fun to rediscover one of the earliest series I followed as a kid. I leave you now with Partners in Kryme's "Turtle Power," from the soundtrack to the first movie (I refuse to acknowledge Vanilla Ice’s “Ninja Rap”). Were X-Men comics in the ‘90s as bad as people think? Overall, I wouldn’t say so. There are certainly a few terrible moments, but look at the sheer volume of material we’re dealing with. Is any franchise this big going to have a perfect record? 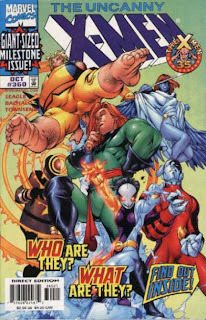 The consensus amongst many fans seems to be that the ‘90s X-books were some of the worst mainstream comics ever published. If you’re talking the first dozen issues or so of X-Force, that’s understandable, but it’s not a fair representation of the entire line. (I should also point out that the harsh feelings over the decade seem to have mellowed out in recent years. Perhaps it’s simply nostalgia, but I wonder if it’s also a reaction against the more serious, “realistic,” “please option us for a movie deal” approach to superheroes we’ve seen in the new millennium). I’m under the impression that many fans lump together the early Image material with the entirety of the X-line in the ‘90s. In reality, the Image creators were only charting the course for less than two years, which hardly represents an entire decade. In fact, the stereotypical Image look disappeared a lot faster in the X-books than it did in the rest of mainstream Marvel and DC. Since that look mostly originated within the X-line, it makes sense that the fad would’ve died out sooner there. 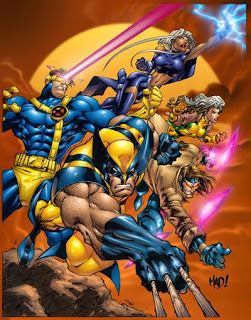 Silly looking characters like X-Treme already seemed antiquated in 1993, and within a few months, Joe Madureira was already merging manga with superheroes for a new style in Uncanny X-Men. 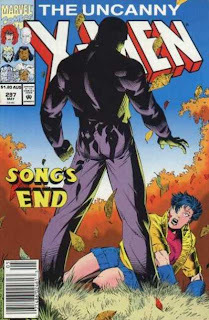 By 1994, Chris Bachalo was bringing his unique look to the X-titles. Now, describing something as better than an early Image title is pretty much the definition of damning it with faint praise. These books have problems. Just looking at the two main books with X-Men in the title, we have a cast that’s too large and unfocused, teammates rarely interacting with one another for years at a time, storylines that drag on for years without proper resolutions, mysteries that drag on for years without proper revelations, lack of direction for months at a time, abrupt changes in direction, the occasional bizarre characterization shift, and routine crossovers that often seem pointless. Uncanny X-Men developed such a fierce following in the 1980s in large part due to its commitment to the characters. Some might find the term “soap opera” demeaning, but I think it’s the best way to describe a never-ending narrative of fictional characters’ lives. There’s an element of that in other Marvel titles, but having the same writer on the book for well over a decade, and the fact that so many storylines were specifically designed to emphasize characterization, put Uncanny X-Men in a different realm than Avengers. In the ‘90s, writer Chris Claremont is gone but editor Bob Harras remains. Harras seems to understand the soap opera appeal, which is probably one of the reasons why so many of these titles have “quiet” issues that mainly consist of conversation scenes. Even if the books are going to devote three months to a crossover event with foil covers and inbound trading cards, the next issue is going to have the characters talking about their feelings. The problem is, there are too many characters to keep track of, so only a few cast members receive the spotlight while long-established characters like Storm and Colossus stand around in the background for years. If you remember the “classic” X-Men, this type of characterization probably isn’t good enough. If you’re twelve, it’s fine. 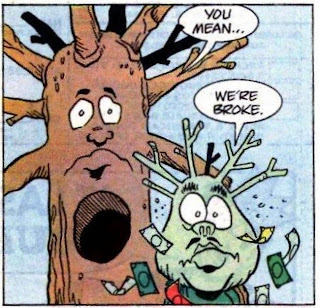 Looking back, I have to say that the majority of the comics I’ve reviewed would be perfectly enjoyable for a twelve-year-old audience. I don’t mean that in a condescending way; that was probably the age group Marvel was going after, and young readers were the fans who kept superhero comics alive for decades. 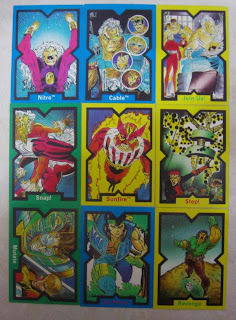 The X-books never became too “adult” in the ‘90s and, despite the repeated “too confusing” claim, welcomed numerous fans of the Saturday morning cartoon into comics. If the line hadn’t bloated out of control, and if the storylines were able to come to natural conclusions instead of dragging on forever, maybe more of those fans would’ve stuck around after the industry crash. Were there too many titles? Yes. Did storylines drag on for too long? Usually. Was the art filled with unnecessary rendering and atrocious anatomy? At times, but it’s a style that mostly disappears by the end of 1993. The majority of the artists on the titles aren’t bad at all, and their work holds up a lot better than the average superhero art of the time. Were the characters cardboard? Characterization is actually still a priority for most of the line. The creators often drop the ball during the larger “events” of the era, and have trouble juggling the larger casts, but there is a sense that the characters matter. As the decade wears on, more and more editors take over the titles while Bob Harras becomes “Group Editor,” and later Editor in Chief of Marvel’s entire line. Something seems to be lost in the transition here, as some characterizations become erratic, storylines seem increasingly aimless, and issue-to-issue continuity is occasionally just disregarded. X-editors do seem to require some unique ability, and I think the latter generation couldn’t manage the store as well as Harras (who certainly had his own flaws). So, yes, a lot of this stuff is bad. However, dismissing it as “early Image” bad isn’t fair. A better example would be the “Onslaught” crossover. The setup has potential, the issues that build up to the event are pretty exciting, and then we realize that all of the early clues don’t add up, the main villain doesn’t even seem to have a plan, and the conclusion makes little sense. It’s more a case of squandered potential than outright incompetence. If you’re willing to overlook some of the flaws, there’s still some solid material to be found during most of the decade. A better description of the decade would be there’s some good, some bad, and a lot of mediocre. But it’s more fun to run Rob Liefeld scans, isn’t it? By the decade’s end, the X-books are still doing well, but they’re facing real competition from other titles within Marvel. A much larger problem is the fact that the entire comics industry has essentially collapsed. The speculators brought in by the gimmicks from early in the decade are gone, new fans brought in by the X-Men cartoon are disappearing, and the older fans seem to take great pride in not reading X-books. The books are stigmatized for being too commercial, even though there’s barely anything “commercial” about the industry at this point. An X-Men movie is in the works, but negative early buzz leaves Marvel content to just ignore whatever Hollywood is doing to their characters. In an effort to please jaded fans, Marvel announces a new determination in 1999 to resolve dangling plotlines that have been around for years. Alan Davis, who initially just agreed to draw six issues of X-Men, is brought in to plot the two main titles indefinitely. Anger over the departure of Steven Seagle and Joe Kelly, and the perception that the books are just ghostwritten by editors anyway, leaves Davis with a hostile audience. Uncanny X-Men & X-Men volume two – UXM and X-Men begin a solid year of crossing over, essentially acting as one bi-weekly title. The year begins with the “Magneto War” event, which is supposed to be the epic return of the character. 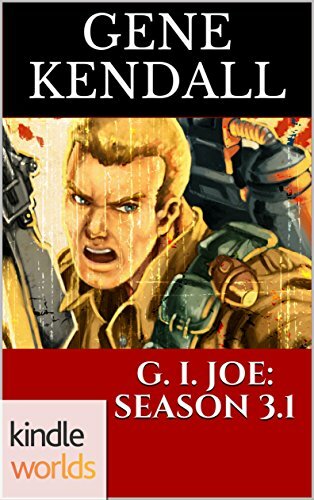 The story resolves the mystery of Joseph’s identity by revealing him as a clone, and ends with the UN caving to Magneto and handing him the island of Genosha. The story wastes too much time with meaningless fight scenes with the Acolytes, and the mystery of Joseph’s origin seems like it’s being resolved because Marvel wants it to be, and not because anyone has a great story for it. Allowing Magneto to take over Genosha isn’t a bad idea, though, and it opens the door for some interesting storylines. 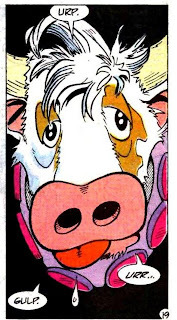 The next story arc is very clearly from Alan Davis’ imagination, as the team is transported to an alien dimension inspired by the works of Steve Ditko. After they save the dimension from Juggernaut, they’re accidentally sent to the Skrull’s homeworld. This is a fun series of issues that are only hampered by scripter Terry Kavanagh’s dialogue, which is often stiff and clumsy. Davis knows how to use the Skrulls creatively, and is able to make the current X-Men work in a fast-paced, traditional superhero story. The team returns home for the “Rage Against the Machine” crossover, which exists solely to set up Marvel’s ill-fated “M-Tech” line. Davis is able to keep some of the character subplots going, but it’s soon obvious the storyline is just a distraction. The Red Skull is revealed as the main villain, and it’s unfortunate that his pairing with the X-Men comes across so dull. “The Shattering” is the next event, although the stories are never as dramatic as Marvel’s marketing machine promised. The story has the team going on a break (not even “disbanding,” although that is the way the solicitations and some of the spinoffs described the affair) after Professor Xavier’s harsh attitude becomes intolerable. Davis uses the event as an excuse to do character-driven stories with a smaller cast of characters. Colossus and Marrow grow closer in Uncanny, while Rogue is reunited with Mystique in X-Men. The stories evoke feelings of X-comics from the ‘80s, and they’re a lot of fun. It’s soon revealed that Xavier’s act was a ruse, designed to flush out a traitor inside the team. When Wolverine is killed by Apocalypse’s new Death Horseman, it’s revealed that he’s actually a Skrull imposter. Death is in fact Wolverine, brainwashed by Apocalypse and newly reunited with his adamantium skeleton. The Wolverine revelation leads into a large Apocalypse storyline, which is unfortunately used to reveal “the Twelve,” a group of significant mutants hinted at years earlier. As it turns out, their significance is to be hooked up to a giant machine that channels their powers to Apocalypse. It’s a disappointing conclusion to the mystery, and it reads like another example of something that’s being resolved just for the sake of being resolved. After Apocalypse absorbs their power, he steals Cyclops’ body and then warps reality for unclear reasons. At this point, Davis isn’t able to convey the various editorial demands into satisfying stories. The buildup to the Apocalypse storyline was clearly well thought out and had a strong execution, but the actual resolution is just one editorial event piled on top of another. The Events: Joseph learns he’s a clone of Magneto shortly before he dies while trying to repair the damage Magneto’s done to the environment. Magneto is recognized by the UN as the ruler of Genosha. The Twelve are revealed as Cyclops, Jean Grey, Cable, Storm, Iceman, Sunfire, Polaris, Magneto, Xavier, Mikhail Rasputin, Bishop, and the Living Monolith. Wolverine is brainwashed by Apocalypse, who bonds his skeleton with adamantium again. Cyclops “dies” after Apocalypse steals his body. The “What Were They Thinking?” Award: It’s hard to understand the reasoning behind the revelation of the Twelve. If 1999 really was supposed to be the year that old plotlines were resolved, it seems like there were more pressing issues to be deal with than a list of names who were supposed to be important figures some day in the future. 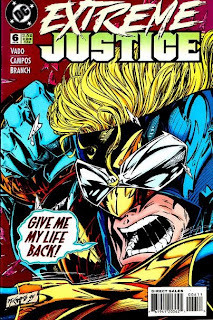 The Legacy Virus storyline still hadn’t been resolved, and after years with no development, it really needed a high profile story to seem relevant again. The Twelve is the type of mystery that could still slowly develop if Marvel wanted it to. Making the Twelve components of a plot device and ignoring what the list was supposed to mean in the first place is another odd decision. What’s the Appeal? : Some old dangling subplots are resolved, Alan Davis and Adam Kubert draw some lovely issues, there’s still a focus on the characters, and the plots become more cohesive from issue to issue. Were the Critics Right? : In the sense that the line is too editorially driven, they probably are right. However, Davis do quite a few issues that are unique to his sensibilities, and for most of the year, he’s able to juggle the character work with the larger event stories Marvel wants. If the Apocalypse storyline was allowed to just be a storyline and not an overblown event, I think the closing issues of the year would’ve also worked.